Update: The DEA has released a statement defending the money laundering stings. The U.S. Attorney's office for the Southern District of New York issued a press release yesterday about its massive civil lawsuit alleging money laundering against the defunct Canadian Lebanese Bank and various U.S. businesses and auto dealerships for engaging in monetary transactions to support Hezbollah. . The 66 page complaint is here. The height of Republican hypocrisy is the phony outrage of Congressman Darryl Issa at the DEA's money laundering stings, particularly in Mexico. These stings are as old as the hills and well-publicized. (Issa's absurd letter to AG Eric Holder is here.) Even Fox News says he's missed the boat on this one. The Justice Department and the State Department acknowledged the laundering this week. The DEA issued this statement earlier this week confirming it. The Guardian has a new investigative report on Wachovia Bank's laundering of billions of dollars for Mexican drug cartels. The information comes from the federal criminal prosecution of Wachovia in Florida that was settled in 2010, and background from a British whistle-blower. Congrats to Ben Kuehne. After two years of being under federal indictment for money laundering resulting from legal advice he gave regarding accepting legal fees from a cocaine trafficker, the Government moved today to dismiss the case, with prejudice. Federal authorities decided to give up their closely watched case against Ben Kuehne, who advised defense attorney Roy Black to accept $5.2 million in payments from defendant Fabio Ochoa after concluding the money was clean. Prosecutors said they dismissed the indictment against Kuehne -- citing ``the interests of justice'' -- mainly because of the recent loss of a crucial appeal over a money-laundering charge that was the backbone of their case, according to a court filing. Good news for Ben Kuehne and the defense bar today. The 11th Circuit has upheld the trial court's dismissal of a money laundering charge against prominent defense attorney Ben Kuehne. (Background here.) The opinion is here. The SDFla Blog has more here. In a ruling favorable to defendants, the Supreme Court today narrowed the application of the crime of money laundering in an opinion by Justice Clarence Thomas. ''The rulings significantly raise the bar for prosecutors to prove money laundering,'' said Jeffrey Green, who represents the National Association of Criminal Defense Lawyers. Green said the decisions also will significantly affect the white-collar world, where money laundering charges are frequently tacked onto alleged violations of the Foreign Corrupt Practices Act, the law designed to prosecute American companies that bribe foreign officials. 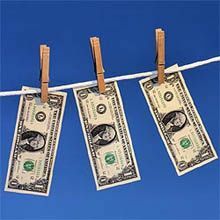 Supreme Court to Define "Money Laundering"
The Supreme Court agreed on Monday to spell out when an individual engaged in “laundering” of crime proceeds has illegally concealed their real source — in effect, what it means to “launder” money. The issue arises in Cuellar v. U.S. (06-1456). This was the only case granted Monday. Click the following links to read the petition for certiorari, brief in opposition, reply brief, and amicus brief on behalf of the National Association of Criminal Defense Lawyers.